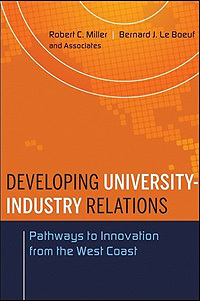 Developing University-Industry Relations (John Wiley & Sons, 2009) is a timely book written for campus leaders and business managers. Edited by Burney Le Boeuf, associate vice chancellor for research at UC Santa Cruz, and Robert Miller, former vice chancellor for research at UCSC, the book addresses the transfer of new discoveries and innovation from the research conducted at universities to the commercial sector. Mastering the relationship between universities and industry has never been more important than in today's turbulent economic environment. The knowledge-based economy continues to draw universities and businesses into close contact and provides significant mutual benefits to both. Developing University-Industry Relations draws on the experiences of some of the most renowned research universities on the U.S. West Coast and in Canada. Contributors include administrators from UC San Diego, Stanford University, University of Arizona, and University of Washington, in addition to UC Santa Cruz. The authors offer a wealth of exemplary best practices and proven strategies from forward-thinking institutions. The book shows what it takes to sustain strong university-industry collaborations that will allow for successful technology transfer. "An important take-home message for most university administrators and faculty is that building long-term relationships with industry is more profitable than a strategy emphasizing financial returns from patent operations," Le Boeuf said. The book explores industry-sponsored agreements that help to establish positive relationships, train students for the workforce, support faculty research, generate indirect-cost funds for infrastructure renewal, and deliver cutting-edge research to the sponsor. The book also describes successful approaches to software and copyright licensing and industry-sponsored consortia.